One of the great things about Tyvek is that you can print it any colour and print whatever design you like on it. Following the great success of our newspaper print range we started to look for a new design. We wanted something that would highlight the style of BO-BORSA bags and accessories. So, after much searching and discussion we decided upon a design created from some Antique French handwritten receipts. 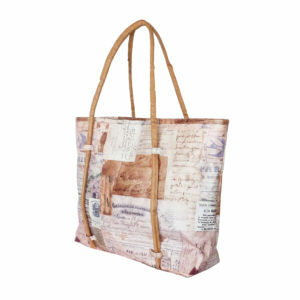 In our opinion, the delicate colours and mixture of handwritten post notes and receipts adds to the overall French style of some of our bags and totes. We began with three of our most popular tote bags plus our very popular ‘envelope’ clutch bag. The first delivery was so popular that it sold out immediately and we are planning a second delivery very soon. Tyvek is being extremely strong and almost impossible to tear. But at the same time it is ultra-light, waterproof, washable, grease and stain resistant, UV resistant and, of course, recyclable, a factor which is very important these days. 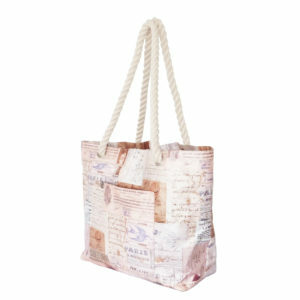 And so, if you would like one our wonderful custom Tyvek bags with our handwritten antique French receipts design. Please be patient, new stock will be arriving soon. Remember to keep looking at our website for new and interesting items.